I’ve been away for a few days so I threw in the two Ultima saga novels and managed to read one of them in the meanwhile. I have read both of these before but it was a long time back and they can’t have made much of an impression as I remembered very little about them. This first in the series was written by Lynn Abbey, and published in 1991 by Popular Library. It’s story is set shortly before the start of Ultima 5. The Avatar hasn’t yet been summoned to Brittannia but Lord British has gone missing and Blackthorn has taken over in his place. 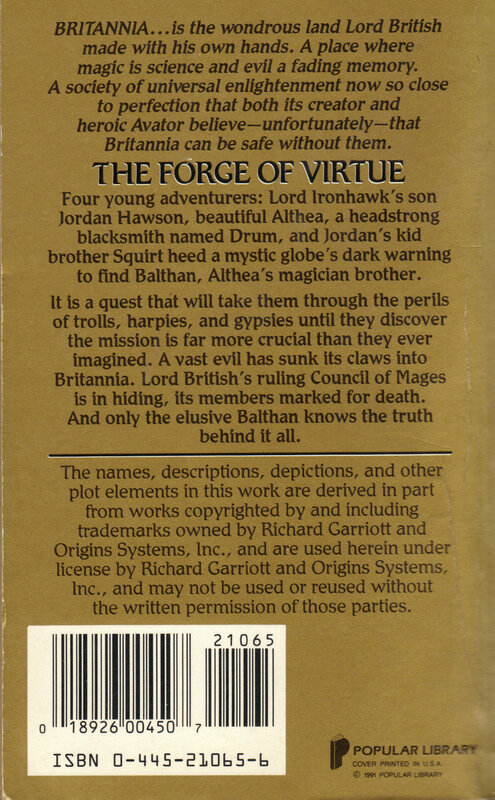 The story follows a few young adventurers (described on the back cover) who at least in this novel, are on the outskirts of the main events. Some of the Avatar’s companions make appearances but they are usually brief with only Shamino appearing for more than a page or two. Althea, Drum and Jordan all set out in secret to attempt to locate Althea’s brother Balthan after Blackthorn makes outlaws of all the magician’s holding the words of power used to seal/open the 8 dungeons. Balthan is the assistant of Felespar and has been with him in Britain for some time putting him at serious risk. Before he left he gave Althea a magical “homunculus” to show his image which now shows a dark line which is acting as a compass pointing in his direction. This leads the 3 (picking up Jordan’s younger brother Darrel aka Squirt on the way), via Britain, to the Avatar’s temple in Cove where they learn Balthan stepped into the flame and never came out. They all follow Balthan into the flame, through the void and a moongate to a spot near Wrong and discover Balthan trapped inside a negate time spell, apparently awaiting the Avatar himself. Before Blackthorn succumbed to the Shadowlords, they appear to have been coming to him while he slept trying to persuade him to steal the word of power from Felespar, and the negate time spell was his way of avoiding sleep. Balthan is rescued but one of his protective spells leaves Jordan blind. He doesn’t actually regain his sight by the end of the book although we do learn that due to the nature of the spell that caused it, he can still see things in his memory after the fact by closing his eyes. Although, the main quest as such is completed, the book doesn’t have anything resembling an ending and it was clearly intended as part of a series right from the start. There was potentially a lot more depth to the Ultima universe than the Wing Commander one to be basing a novel on, due to the different nature of the two series. 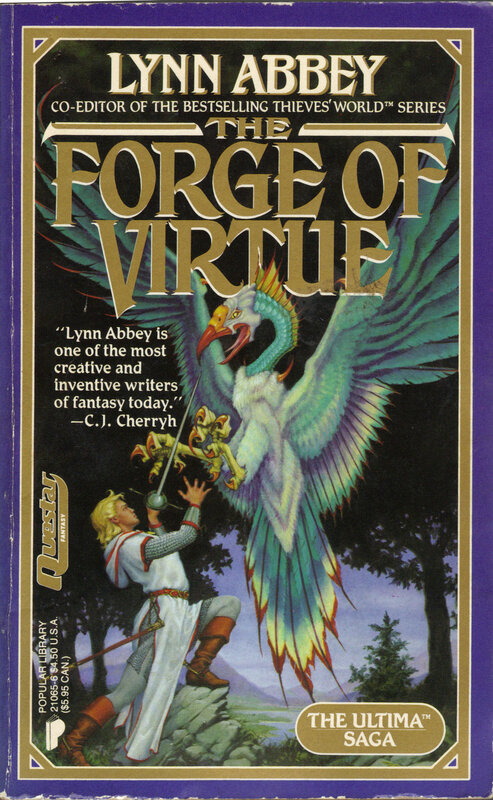 Forge Of Virtue was for the most part quite faithful with all sorts of details from the games cropping up. The Britannia shown here still has a strong class system despite Lord British’s attempts with only the “Peers” being able to attempt to follow the Avatar’s quest, as something of a rite of passage. The magical system is frequently mentioned with the same verbs and reagents as the games and of course some of the locations from Britannia are in here although there isn’t all that much ground covered during the course of the book. At the speed these guys move we would have needed another 10 books to cover every major location in Britannia. I’m sure there are elements that weren’t faithful to the games as well. The only thing that really struck me was one of the Peers having a slave which can’t be virtuous but this was only mentioned in one sentence. The story is a fairly typical fantasy arrangement with some young characters running away from their home to go on a journey/quest. It is as much about Britannia and the effect that Blackthorn and the Shadowlords are having on it as anything else. I did enjoy the way the novel picked its way through some familiar events and places, expanding on them. I can’t imagine that anyone unfamiliar with Ultima would have made much of a lot of this though. The plot itself wasn’t especially strong either with surprisingly few significant events in the books 300 pages. I think I’ve only ever seen harsh reviews of this series. If it didn’t have the Ultima connection, I’d probably have hated it. With the Ultima connection, I quite liked it but I would say it’s a slow start and I hope things pick up a little in the next one.